Enrico Correggia is a versatile, dynamic and inspiring Italian conductor, singer and composer. 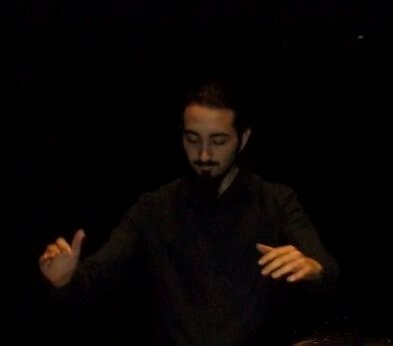 Having graduated with the highest possible marks in conducting under Lorenzo Donati in the "F. A. Bonporti" Conservatoire of Trento, he is very active in the divulgation of music from the Middle Ages and the Renaissance. He is in high demand as a low bass with the most important Italian professional choirs, singing regularly in Coro Giovanile Italiano, UT insieme vocale-consonante (Arezzo), Ars Cantica choir (Milano) and Coro "Chigi Saracini" of Accademia Chigiana (Siena). He also sings occasionally with other world-famous organisations such as the Sistine Chapel choir in the Vatican. His flexibility with regards to style and genre allowed him to sing with a selection of singers from Coro Giovanile Italiano with the Rolling Stones (Roma, 2014). He has won first prize in important international competitions such as Florilege Vocal (Tours, 2014, Coro Giovanile Italiano), International May Choir Competition “G. Dimitrov” (Varna, 2015, UT insieme vocale-consonante) and European Grand Prix for Choral Singing (Varna, 2016, UT insieme vocale-consonante). Appreciated as a composer for the clarity of his lines and his strong historical background, he has been taught by Lorenzo Donati, Gianmartino Durighello and Z. Randall Stroope. In 2017 he was selected as representative composer for Sardinia in the "Officina Corale del Futuro" project by Feniarco, the Italian National Federation for Choral Music. In the same year he is Assistant Professor in the 9th European Academy for Choral Conductors in Fano, led by Ragnar Rasmussen. Known as a conductor for his encouraging attitude and his knowledge of styles and repertoires, he studied conducting with several teachers, including Lorenzo Donati, Marco Berrini, Erik Westberg, Ragnar Rasmussen and Nicole Corti. He's founder and conductor of "Exsurge Domine" Ensemble, which specialises in medieval sacred music, "Aletheia Consort", a male-voices sextet which specialises in late medieval and renaissance music, and “Allegri Penitenti”, based in Trento, which specialises in late renaissance and early baroque music. He is also widely appreciated as a scholar and a lecturer. He had the chance to study medieval sacred music with professors such as Guido Milanese, Johannes B. Göschl, Marco Gozzi, Juan Carlos Asensio Palacios and Giacomo Baroffio. In 2019 he lectured in the international conference of gregorian chant organised by the AISCGre in Assisi for the 40th anniversary of the publication of the Graduale Triplex. His most significant contribution to the field of ancient music regards Allegri's Miserere, the legendary piece written for the Sistine Chapel choir, whose evolution through the centuries he has studied closely, having had the opportunity to deeply analyse lots of historical sources.